I am a PhD candidate in the UCLA Graphics and Vision Lab, advised by Professor Demetri Terzopoulos. My research interests are in medical image analysis, machine learning, computer vision, and visualization. I am particularly interested in deep learning, especially applied to medical image analysis. 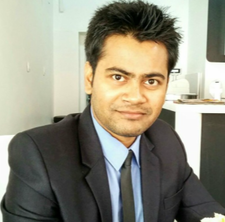 Before starting my PhD, I received an MS in Computer Science degree from Delaware State University (DSU) in 2016 and a Bachelor in Computer Science and Engineering degree from Rajshahi University of Engineering and Technology (RUET), Bangladesh in 2012. Previously, I worked in the Medical Imaging and Simulation (MEDIS) Lab at DSU, jointly advised by Professor David Pokrajac (DSU) and Professor Predrag Bakic (UPenn). Int. Conference on Advanced Technologies, Systems, and Services in Telecommunications - TELSIKS, Nis, Serbia, 2015.